When you visit Hartford's fine Wadsworth Atheneum art museum, be sure to have a look at Alexander Calder's Stegosaurus in Burr Mall. 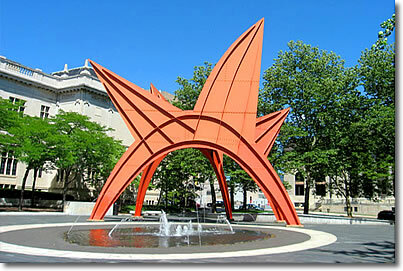 Between Wadsworth Atheneum and the attractive city executive office building, Burr Mall is a shady, fragrant spot with a fountain and a fine—if incongruously placed—stabile by Alexander Calder called Stegosaurus (1971). Alexander Calder's Stegosaurus on Burr Mall. Across Prospect Street from Burr Mall, take a look at the interesting buildings: the Masonic Temple and the Hartford Times Building. The facade for the latter was once the front of a church in New York, which explains its architecture, odd for a newspaper building!